George Stoppani builds instruments (baroque and modern), manufactures period strings, and is a leading researcher in violin acoustics. A self-taught computer programmer, he developed a highly sophisticated suite of software for modal analysis and sound radiation measurements of stringed instruments. After studying Literature at York University, Stoppani turned to instrument making in the mid-1970s. He soon developed a relationship with Northern Renaissance Instruments in Manchester, where he built a large number of period instruments and became interested in period strings. 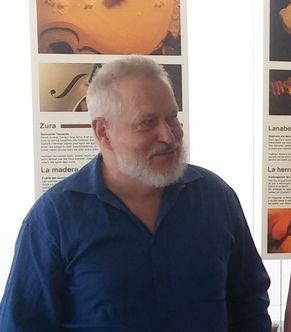 Stoppani has been a VSA-Oberlin Acoustics Workshop faculty member since 2006, and has lectured widely in Europe and America on on violin acoustics. He has written for Strad Magazine, Early Music Today, the BVMA newsletter, and the CAS Journal. Stoppani works closely with Curtin on many aspects of violin acoustics, particularly the development of acoustical measurement methods that can be used as working tools for violin-makers.